Fun stuff though a build log or some other specific info would be nice. I’m sorry we haven’t provided more details (you can read a bit more on the linked site). We thought it’d be nice to show it now while it’s still working and we may be able to write about it more later. Temperature is an issue even in non-cryogenic Prague :). If the temperature drops to approx. 0°C the RaspPI doesn’t boot up. 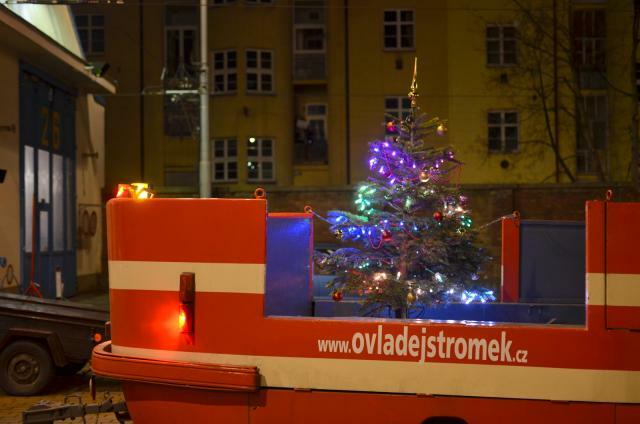 Sometimes a tram driver turns the tree off at the end of the line (it’s powered from a safety beacon), it cools down and we’re in trouble because it doesn’t start up. Of course, it’s possible, but the box was closed in the cold air so there should not be much to condensate. It’d be nice to test it later. I’ll be happy to hear more about other silly decisions.